On August 25th, Hurricane Harvey, a Category 4 storm, made landfall between Port Arkansas and Port O’Connor, Texas. The storm has devastated Houston and the Gulf Coast of Texas. FEMA estimated that 30,000 people will now be seeking shelter and 450,000 may qualify for federal flood victim assistance. Thus far, 30 people have lost their lives. Fortunately, people across the country are lending a hand and you can too with a few mindful tips. Lots of people have been doing their part to help the survivors. The owner of the Houston Rockets, Leslie Alexander, donated $4 million to the Hurricane Harvey Relief Fund. Actress Sandra Bullock donated $1 million for Hurricane Harvey relief. Comedian Kevin Hart pledged to donate $25,000 and challenged his fellow celebrities to do the same. And Jim McIngvale and his Galley Furniture chain even turned two of its Houston furniture galleries into shelters for hurricane victims. Companies are doing their part to help as well. 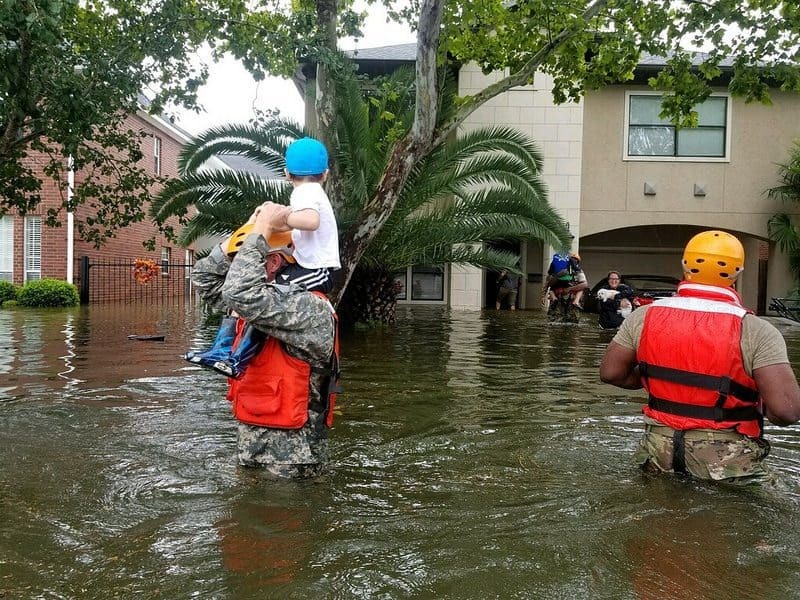 Verizon has pledged $10 million for Hurricane Harvey relief and deployed employees and equipment to help facilitate communication services in the area. Lowe’s donated $500,000 to the Red Cross. The Coca-Cola Foundation has donated $1 million to the relief effort as well as 25,000 cases of water, milk, sports drinks, and other beverages to the survivors. And Bass Pro Shops donated 80 Tracker boats and supplies to government and rescue agencies. Bass Pro Shops is committed to supporting rescue and relief efforts related to Hurricane #harvey. We’re providing more than 80 Tracker boats to government agencies and rescue organizations and donating $40,000 worth of essential supplies to @convoyofhope and @americanredcross. Want to help? Tap in the link in our bio and make a Red Cross donation! You can do your part by donating funds, goods, or resources to the Hurricane Harvey survivors. Listed below are a few organizations that are taking donations. The Greater Houston Community Foundation and Houston’s mayor Sylvester Turner have created the Hurricane Harvey Relief Fund. The fund will help those affected by the floods. You can make an online donation here, send a check, or text to donate money to the fund. The National VOAD is an “association of organizations that mitigate and alleviate the impact of disasters.” Some of the association members include Habitat for Humanity, American Red Cross, and All Hands Volunteer. The National VOAD is helping to coordinate a response to the Hurricane Harvey disaster. You can donate money to a National VOAD Member or you can volunteer with one of the National VOAD association members. The food bank is helping people across southeast Texas how have been impacted by the hurricane. Cash donations can help them feed hundreds of hungry people—every $1 provides 3 meals for those in need. You can also donate your time by volunteering with the bank or donate supplies, including toiletries, diapers, cleaning supplies, and snacks. Find more information here. Bonus. Other organizations you should consider donating to include the American Red Cross and the Salvation Army.